Does anyone know when these shortwave links were first erected? After Hibernia’s cable perhaps? @lifted: this blog details those microwave links in extensive detail over the last 5 years, this post refers to shortwave. A first shortwave network was built in 2011 in the US (down now) – we’ll detail later. It seems trading firms started to build US-EU HF networks before Hibernia went live. More details to come. What about satellites? Don’t know anything about radio, but it seemed to me that satellites would be the ideal way to do this low latency trading. Satellites in low orbit, just a little above the ionosphere would have only a slightly greater latency than HF, but most of the communications satellites orbit about 23,000 miles up, with around a quarter of a second for a signal to traverse the earth-satellite-earth path. They probably have filed a wavier request for experimental use of HF radio with the FCC, if they are transmitting from this site. There was a story some years back that inferred that trading info was getting from NYC to Chicago a few milliseconds faster than the standard means or wire or cable could do it. Is that explained by these shortwave links? I would think that the bandwidth limits would put very strict limits on the length of messages and the amount of redundancy added for error-correction that a few milliseconds of signal can contain. Is there any complementary information from the markets that would indicate who is trading what by these means? A very interesting article, thank you. I’d not heard of this type of network but it makes sense. I ask about the transmitters since that tower base doesn’t show any type of container for the transmitters, and the USRP is a receiver-only system. So, did you find a separate transmitter site? Spatial separation is your friend in HF links, and would indicate such. The base of the West Chicago tower contains a building that wasn’t pictured. It could hold a 6 kW transmitter, which I believe the site is licensed for. I have no hands-on experience with USRP, but the Wikipedia page suggests that the mother board accepts various daughter boards for RX, TX, or both. I don’t believe that an experimental license is needed for RX, so it’s possible that the licensed site I found is TX only and that there’s another RX only site somewhere else. But my guess is that they operate the link in half duplex and have only the site I found. I think you have the right ideas about ACKs. I’m not current on FCC regulations, but I’m guessing that once an amplifier is type accepted, then the FCC cares mostly about what you excite it with. I’m assuming that there’s not a lot of tuning to do on modern broadband power amps, so if you’re outside your allowed bandwidth or on the wrong frequency, it’s because you fed the amp something bad. I’m just inferring this based what I see, so it could be wrong. Thanks for the reply, Bob. An interesting chain of SDR ~ something, something ~ antennas. It all looks kosher to me, I’m less up on the regulatory end while I find the tech and the concept fascinating. This particular network has interesting frequency bands (esp. Seattle), and a lot of proposed data bandwidths. Cool stuff, and a good puzzle. What is the inferred purpose of the stations in Seattle? Isn’t Portland closer to the far east? These applications show usage of frequencies around 5 MHz at US east coast/west coast/midwest stations. 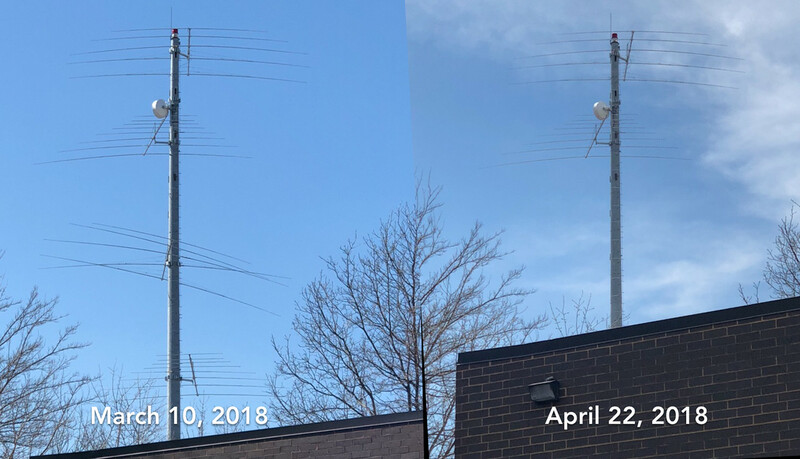 Are any of the antennas shown in the photos long enough (about 100 ft) for that frequency? I did notice that the Kane County picture had 4 tours arranged in a pattern resembling a rhombus. Which way is that pointing? If these stations are used over paths of 4,000 miles or more in that band, would not most of the path be in darkness during use? Are the commodities markets all operating around-the-clock worldwide? Given the narrow frequency bands shown in those documents, one would not have a great deal of trouble setting up near those stations and doing some traffic analysis. The fact that correlated prices exist in geographically-separated markets provides all the incentive traders need to build lower-latency ways to transmit prices. Chained microwave links between markets have been well documented in other posts on this blog. Their latency is significantly lower than fiber. They’re less reliable than fiber, have lower bandwidth, and don’t reach across oceans like fiber. Shortwave enters the picture in this post because it can reach across oceans like fiber, while maintaining the latency benefits of microwave, but sacrificing reliability and bandwidth. Even though shortwave has substantially lower latency than fiber, the hypotenuse up to the ionosphere makes the latency higher than chained microwave links, which just have to be high enough to clear the curvature of the earth and other obstructions. You and I must be brothers from another mother as I do this exact same thing. I’ll be driving with my wife in the car and she’ll go “Oh oh oh!!!! There’s another tower!” One day when she did that I pissed her off by pulling over and taking pictures just as you did lol. Love doing this rabbit hole research. If this high frequency trading is so lucrative, why don’t all these fast traders bundle their resources and establish a Tropospheric-Scatter link across the North Atlantic to give them a temporal advantage? Say, N. Canada Greenland Iceland N. Scotland, and existing traditional terrestrial microwave the rest of the way. Tropo is fast like HF Radio, but far more reliable. It also costs a lot more to build and run. The bandwidth is much larger than HF Radio, but far less than fiber (a typical Tropo link carrier runs at 2GHz). Traditional tropo links can run upwards to around 1,000 km each. But links that long are expensive to build and operate (think around $1+ Million per site). But utilizing the latest in coding and modulation techniques in a Software Defined Radio (SDR) those costs can probably be reduced from one to three orders of magnitude with an attendant reduction in the amount of usable bandwidth. good f’ing luck *licensing* a tropo link, anywhere, for anything other than defense/military/etc use, in 2018.
also: what do you think the rule of thumb is for excess path loss & gaseous loss on top of free-space loss for tropo? I’ll wait while you google it. Traders don’t share resources … information arbitrage includes both the markets and technology to participate. I’m sure there are readers of this blog who are aggravated that these systems are becoming common knowledge. Traders that are getting picked off or seeing returns decreased in a market but hadn’t figured out why will be looking at this as a possible answer. The cool thing here is that there are many markets that this can be applied and the costs to erect and antenna to point towards emerging markets is trivial! The fun aspect of this for the spectators is that there are many SDR receivers all over the world that can be tuned to pick up these transmissions. Don’t expect to be able to be able to use the data though as the decode latency on those SDR’s is awful and the data itself will be obfuscated. Those who point out that HF has reliability issues need to remember that these companies don’t need to make every lucrative trade they could possibly make with a perfect communication channel. If these transactions are sure and profitable, they making half of them would remain profitable. As I see this working, you know something has been selling for a $1.00 in Chicago and just jumped to $1.01, you buy 100,000 of them at that $1.00 price in Europe. Then when the price increase hits mere fractions of a second later, you sell your $1.00 purchase for $1.01. You’ve just made a guaranteed $1000. Someone correct me if that’s not what’s going on here. Excellent post! I’m originally from Chicago (now live in SoCal), am also a ham and Dxer, and a good friend of mine used to work the Merc. This, tho, is new to me and I’m looking forward to reading more about it. Will you be posting freqs and mode(s) of operation? Dave, Glad you liked the post. Maybe we crossed paths at Bell Labs Naperville in the mid 80’s? Your name sounds familiar. The FCC experimental licenses (e.g. linked in comments above) do list a range of frequencies and emissions designators (i.e. modulation or mode). The range of frequencies is quite broad and many licensees file for pretty much any kind of modulation you can imagine, from on-off keying to QAM128. The bandwidth is also given, but I think 48 kHz is the largest I’ve seen. There are some SWLers who’ve picked up at least the test signals from experimental shortwave stations and recorded them. I believe there’s a link to one of those above too. Why don’t you tell us the frequency range of the antennas or what frequencies they are operating on. All trivial with a $7 RTL receiver on a tablet to see if they are transmitting and a compass and tape measure to figure out the antenna frequencies. I don’t understand why so many people are replying to this with fantasy when the facts are trivial to discover. For reference, I sold one of my Ettus Research radios to a perfectly normal cellular telephone company in singapore. they use them for diagnostics and as the RF section of cellular towers. The USRP can be configured as a fully functional multi channel cellular base station using entirely open source software. They have two or four coherent full duplex RF channels which means they are also useful for ranging and direction finding those signals in realtime as well as a coherent satellite relay. his is pretty basic stuff but most hams live in the 1960s on SSB and FM using 1940s radio designs. I can see how they might not realize the modern world has better tech. Very interesting! I checked the FCC filing, which shows the frequency ranges they are authorized. Do you know of any exact frequencies that thy use? I’m involved with a group of fellow radio hobbyists, and I wonder if these transmissions explain some of the signals we have been observing, and written off as being random military transmissions. That’s the list I looked at earlier. It shows some rather wide frequency ranges, but no exact frequencies. So I was curious if anyone had monitored the transmissions, and noted exact frequencies. Or how about some waterfalls of transmissions so we know what they look like. Many of us radio hobbyists have SDRs (I have 4 myself), and would be interesting in observing these transmissions. We’ve been involved in monitoring Shortwave Spy Numbers transmissions in the past (which you may have heard of), and coordinated monitoring of these stations could help shed some further light on them. For example, based on the frequency and time of day, we can estimate the target reception areas, based on shortwave propagation characteristics. You can find the licensed frequencies in the FCC license database and online websdr receivers can be used to ‘listen in’ … There is a lot of buzz on this topic and I know the author is covering this at the STAC conference https://stacresearch.com/spring2018NYC and I’ll be talking about it at https://intelligenttradingtechnology.com/events/intelligent-trading-summit-its-new-york-city. There are multiple ways to license these stations and the costs to build aren’t extortionate, especially considering the profitability of a riskless trade! Just think of all the markets globally that could be opened up .. HAM Radio will become the new must-have skill set for prop trading firms! Hi, suppose they use the same site for tx and rx? I kinda doubt it but it could be done. And yes it’d be interesting to see the waveform. After the technology is proven, I can believe they might try simultaneous TX and RX (i.e. “full duplex”). But for now, I’m guessing they’re doing one or the other (“half duplex”). Full duplex from a single site is somewhere between technically very challenging and impossible. In a nutshell, it’s hard to hear anybody else when your own transmitter is on. There are a set of trades that follow the release of government statistics like non-farm labor. You know in advance when the announcement will happen and you have the transmitter hot on that end of the link. Note that the time required to switch the direction of a half duplex link is at least one full round-trip time. The current transmitter has to stop and wait for the last bit it sent to arrive at the receiver. Then the previous receiver can start transmitting, but the first bit it sends won’t arrive until it propagates back to the previous transmitter. Any form of duplex operation would require licensed broadcast capability in that jurisdiction. I would suggest most trading strategies could work on the basis of a broadcast event at low latency and a regular speed confirmation. Essentially send the order via radio, receive the confirm via a regular link. A 10ms advantage to markets in Europe is a game changer, the same for many other markets this opens up. Firms using these will print money as a function of how reliable they can make the link and how many markets/strategies they can scale to. The open question is how do you defend your trading strategy against someone that can effectively see into your future? Last summer we ran across an identical site east of Chicago, west of Ft Wayne, about 1 mile north of highway 30. A number of us has been doing research and going crazy about what it could be. Some bank loans are paid interest down to the millisecond, so I can see a market for this link in the banking sector. Thanks, I have visited that site and photographed it. Details forthcoming. There is a site in Illinois (near a horse track). It is extremely large and really interesting! The antennas are like giant wired bazookas. What is going on at this site?? Horizontal HF log periodic array. higher frequency elements near the stub mast away from the building. A directional array with a fairly broad azimuth. Useful for medium distance circuits, ~1000 km to ~5000 km. Broad frequency coverage over 1.5 octave or so. Size would suggest longer wavelengths which makes them less likely to be used for transatlantic trading. 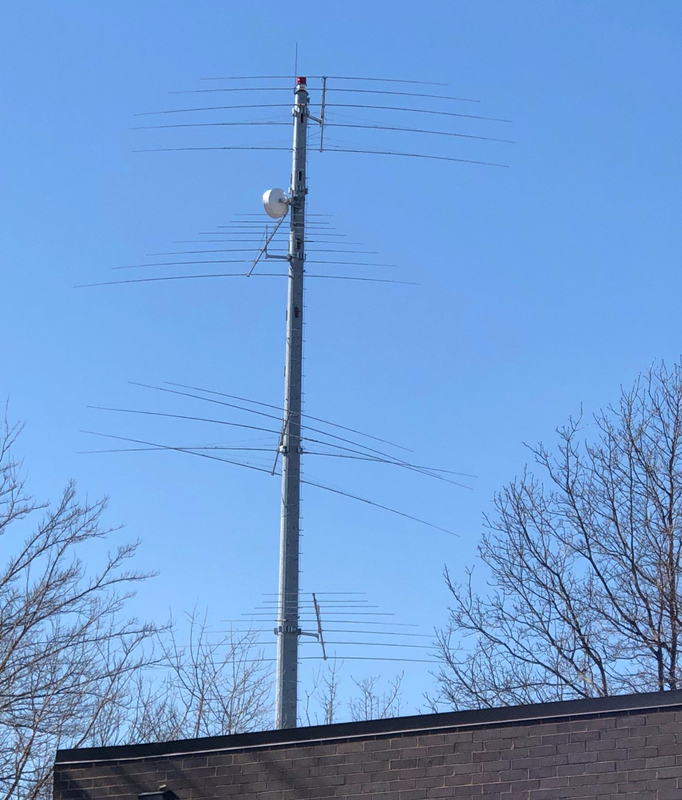 If the sites don’t employ full duplex via the same site, perhaps the rural sites are the rx end while the tx sites will be in the cities where rfi is no issue to the system performance. It’d also be interesting to see how much data they’re wanting to pass. A modified for commerce HFDL would be lovely for short fast buy/sell/ack but I suppose they’re passing gobs of data and will have several kc in use.